Yep, that’s right. 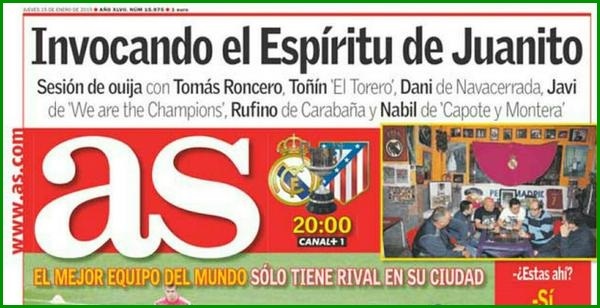 AS reporter Tomas Roncero has staged a seance during which he used a ouija board to contact the ghost of Real Madrid legend Juanito. The purpose? Not to uncover the secrets of the afterlife, but to ask the late striker what he though the score would be in the second leg of Real’s Copa Del Rey tie against Atletico Madrid tonight. For the record, Juanito was killed in a car crash in 1992 at the age of 37. Amazingly enough, Roncero was able to get through to Juanito, who duly informed the group that Real would successfully overturn their 2-0 first leg defeat and advance to the next round courtesy of a 3-0 second-leg victory at the Bernabeu. There you go. Stick your house on it. The full video is available over on the AS website should you feel the need to further putrefy your grey matter by watching it.